* Online registration has been closed (May 14, 2017). It will be done at the venue. * Hotel Supreme is no longer available for LIVE IN participants as of May 11, 2017. Please refer to the notice in the main page for complete information. * Submission of Extended Abstract is closed. 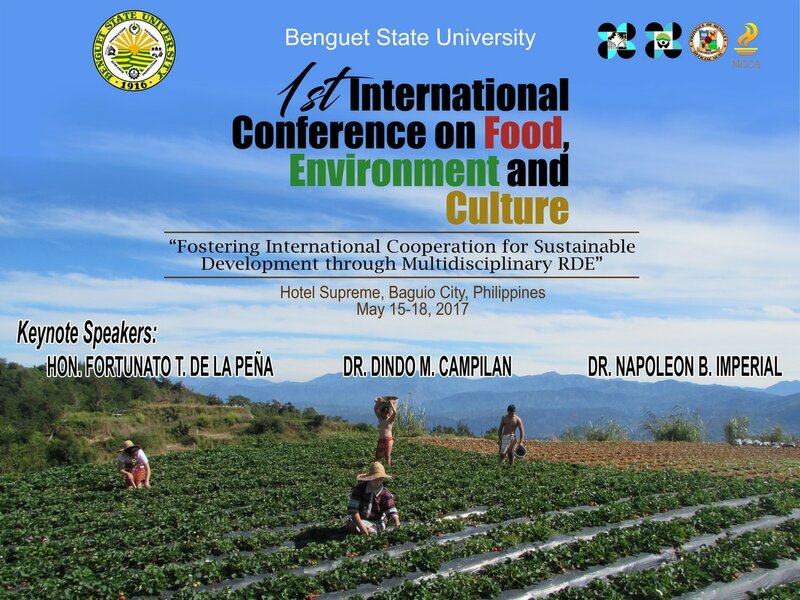 The 1st International Conference on Food, Environment and Culture will be held at Supreme Hotel on May 15-18, 2017. It consists of plenary sessions, panel discussions as well as opening and closing sessions. PRESENTATIONS DURING THE CONFERENCE ARE NOW AVAILABLE FOR DOWNLOAD! The purpose of the Conference is to showcase and enhance learning experiences from research outputs in the multidisciplinary field of Food, Environment, and Culture. Bringing together local and foreign researchers will renew and foster new partnerships in various fields. This is to strengthen the connection not only in local but also international. Achieving global food security while reconciling demands on the environment is the greatest challenge being faced by humanity today. It has been reported that by 2050 at least 9 billion people will need food. The urgency of the issue has led many researchers and scientists all over the world to conduct researches to come up with technological interventions to ensure food availability. These resulted to huge volume of scientific research findings. The 1st International Conference on Food, Environment and Culture therefore aims to deliver analysis, inspiring visions and innovative methods arising from research in a wide range of disciplines. At the local scene, the Benguet State University has been in the forefront of promoting excellence in research and technological innovations, development and sharing of applications of knowledge while improving the resilience of the farming community as well as the development of livelihood opportunities in the region. In the past years, the course of Research, Development and Extension activities in the University had been evolving as manifested by the different RDE Programs it has implemented in the past. The development of these programs encouraged researchers to expand their horizons by collaborating with researchers and scientists here and abroad. These have resulted to the advancement of the agriculture and allied industries in the region and the country as a whole. The International Conference aims to better understand behavioral, biophysical, economic, institutional, political, socio-cultural and technological drivers, current and future global food security and environmental protection. The conference will address the food system activities of food production from crop, livestock, tree, processing, distributing and consuming food and trade- offs between economic, environmental, health and social objectives and outcomes. The theme that will provide a focus on the Conference is, “Fostering International Cooperation for Sustainable Development through Multidisciplinary RDE”.